I’m not sure what it is about the colonial city of Valladolid that makes us as happy as it does. We’re still not sure how to pronounce it, Ba-ah-doe-leed, Va-jah-do-leed. When you ask people that originate from the area, everyone says it differently. There’s not a lot of things to do in Valladolid. You eat, you drink, you sleep. So what makes this Yucatan town a place that we’ve returned to several times now? Valladolid, Mexico is a small, walkable city that can easily be discovered in an afternoon. But you’ll want to rent a car, hire a tour, or become familiar with colectivos (shared taxis) because it makes a great base to travel the Yucatan Peninsula. The region has a high concentration of cenotes, Mayan ruins, and cute pueblos that beg to be explored. We drove our motorcycle from Cozumel on our most recent visit, and Julien created a fun pueblo and cenote tour near Valladolid. It was a full day excursion, stopping to take a ton of photos and swim in multiple cenotes. And we found a small cantina in the jungle where we ordered beers and a small bowl of guacamole. Let’s check out the best things to do in Valladolid, Mexico and the surrounding area..
We love walking around Valladolid to admire its charming streets and colonial buildings. The town is easy to navigate on your own but if you want to learn more about the history, we recommend taking a Free Walking Tour of Valladolid. Jesus, our tour guide, started giving tours out of a love of sharing his culture with visitors. He is also a wealth of information about the surrounding areas of the Yucatan. By speaking with him, you may discover even more things to do in Valladolid! Like most towns in the Yucatan, the Zócalo is a meeting point and place to rest. Big trees provide shade to sit in the traditional Yucatan chairs known as “sillas tu y yo” (you and me chairs). These white chairs sit opposite each other, bound by an armrest so that friends and lovers can face each other to conversate. Valladolid’s main church, San Servacio, is located on the Zócalo. It’s an impressive structure which won’t require a lot of time to see, but there are five other churches in the historic center. I recommend Candeleria Church in our favorite area, or San Bernardino, which was built as a church and fortress. At night they host an impressive light show that tells the history of the building. Check the schedule before you go as the days vary by the season. 9 pm Spanish, 9:15 pm English. Valladolid has an easy to navigate Mercado (open-air market). 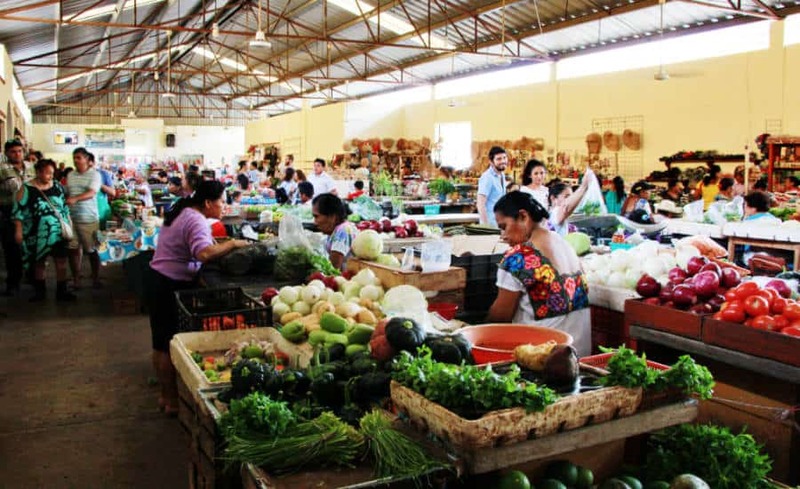 The size is manageable, so you don’t feel like you’ll never see your partner again, unlike the huge Mercado in Merida. It’s also a great place to have an inexpensive local meal. Mercado visits are a staple for every town that we visit, but it took us three stays in Valladolid to visit this market. It’s now one of our favorite things to do in Valladolid. This private home showcases an impressive collection of more than 3,000 pieces of Mexican folk art. The homeowners, who consider themselves ‘custodians’ rather than owners of their collection, open their doors to the public every day for tours in English and Spanish. There is a suggested donation of 60 pesos which is donated to regional charities. Tours are every day at 10 am and a reservation is not required. After admiring the beautiful art at Casa de los Venados, go shopping in Valladolid for your own treasures to take home. Before visiting Oaxaca, this was Julien’s favorite town to shop for alebrijes – the mythical creatures carved from Copal wood and delicately painted. Two shops in Valladolid to find quality Mexican art are Yalat Arte Mexicano and Kux Tal Arte Popular. Julien’s mom and JT at the top of Ek Balam Mayan Ruins located 20 minutes north of Valladolid. Chichen Itza is the most popular Mayan Ruin when staying in Valladolid. You’ll have to wake up early to make the drive and beat the crowds. However, Ek Balam is an easy 30-minute drive north of Valladolid and often less crowded. Both are amazing architectural sites of Mexico, but we enjoyed Ek Balam more since there are fewer people and you can still climb the ruins. It’s a great view of the jungle below and on a clear day you can see the temples of Coba and Chichen Itza. The cenote at Hacienda Oxman near Valladolid. There are thousands of cenotes (underground sinkholes) in the Yucatan. Cenote Zaci is located in the town of Valladolid, just a few blocks from the main square. Cavernous walls with carefully carved walkways lead you to a refreshing pool of cool water that can feel like a godsend after a day in the Yucatan heat and humidity. But don’t limit yourself to just one cenote during your Mexican travels. 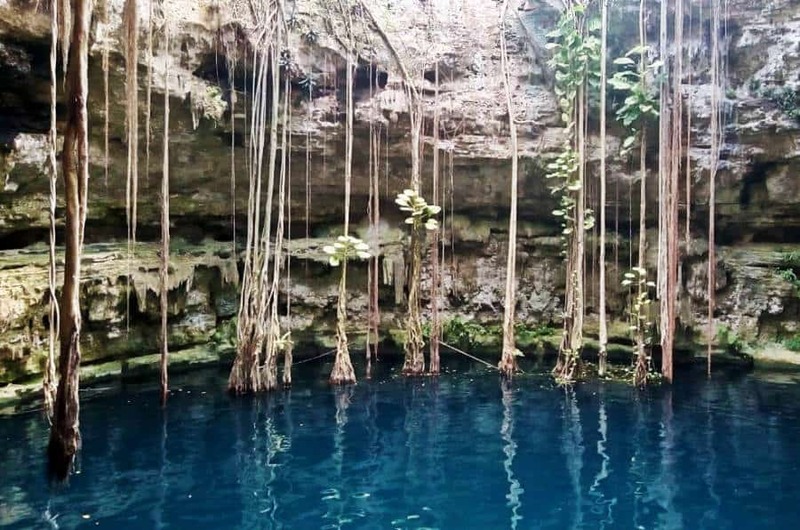 There are thousands of cenotes within a couple hours drive, but many are close to Valladolid. Tip: The best photos of the cenote are around midday since the sun is centered over the opening. On your way back from Ek Balam, stop in Temozon for lunch. This small Yucatecan town is known for its smoked meats, including the popular longaniza sausage. Before our first visit to Temozon, I read we would see longaniza hanging in small vendor shops along the main road. While this wasn’t the case during our visit, we did find a small shop a couple of blocks in town that happily sold us a small amount. For lunch, I recommend sharing a plate of mixed smoked meats (with tortillas, of course) and ordering a couple cervezas. We ate at El Negrito Ahumado and would definitely recommend it. We also purchased a killer homemade hot sauce as we were leaving. Tucked away on the square near Candelaria church, this is our favorite place to stay in Valladolid. You can rent a single dorm bed or a private room for up to four people, making it a great value. Our favorite aspect is the tropical courtyard where you can meet new friends at night and enjoy a fabulous complimentary breakfast by morning. But the secret is out, so book ahead to reserve your stay at Hostel Candelaria. This is another great hostel in Valladolid. Spacious dorm rooms with comfortable beds and modern bathroom, or you can rent a private room up to four people. The tropical outdoor areas include various hammocks and a small kitchen. Great location close to the center. A great value for a rental in Valladolid with a small pool and plenty of outdoor space. Dorms and private rooms are basic but comfortable. The location three blocks from the main square makes it a great value. This unique accommodation in Valladolid features a regular swimming pool and a heated saltwater pool nestled in an underground cave. Natural elements and Mexican folk art infused into the rooms create a beautiful environment. The on-site restaurant makes a complimentary breakfast for its guests. This historic colonial home was converted into a hotel featuring long verandas overlooking the swimming pool. The rooms are light and airy with luxury bathrooms and accents of traditional Mexican tile. This Valladolid hotel is located next to the main square and includes a complimentary breakfast. The food in Valladolid is some of the best in the Yucatan. It’s not pretentious, and it’s nothing special, but every cook puts effort into what they’re creating. Every dish you order has been recreated for hundreds of years, but the consideration for quality ingredients is evident. The community has a love for their heritage and the traditional ways of doing things. A bowl of red Pozole from the food court in Valladolid. Just off of the Zocalo undoubtedly you will pass by this ‘mercado’ numerous times as you’re out exploring. There are close to 12 restaurants to choose from making it quick and easy if you’re out and about, especially with a group. While there are variances, the stalls offer similar foods with subtle differences. The exception being the small Chinese restaurant and the little Mayan joint. There is plenty of seating and food court style service, this is a local cheap eat. The food vendors here are just a touch assertive, but very friendly. A luncheria on the cusp of being expensive (for Mexico), but the food is done very well – Yucatecan and plated in an appealing way. I have mentioned plating twice now, but you don’t get to see much ‘flare’ in a lot of the places that we’ve been in this part of Mexico. There are many choices for vegans/vegetarians, plenty of options to satisfy anyone’s hunger. A Mayan restaurant that delivers high-quality ingredients made in the time honored fashion of the Maya people. Jose, the owner met us at the door and gave a quick tour, highlighting the plants and techniques used in traditional cooking. Everyone employed at his restaurant are of Maya descent. The menu includes vegan/vegetarian options, but I believe more can be prepared upon request. This is a truly unique dining experience, unlike anything we’ve experienced in the Yucatan. A metate used to grind corn for tortillas (right; A basket of fresh made tortillas at Ik Cat Ix (left). Nightlife in the conservative city of Valladolid is limited. There are a handful of cantinas spattered around the city center where you can have a drink with men in their late 30’s-60’s. On Friday and Saturday, there’s a lively youth that goes out to have a few drinks with friends. This is not a city for raging parties, or drinks out past 8:00 pm on a weeknight. That doesn’t matter, you’re going to be trying to take in everything that you did during your day touring around Valladolid and prepare for your next ruin and cenote tour from Valladolid early the next day anyway. Mayan culture is celebrated in Valladolid, it’s everywhere. We have met people in Cozumel, Merida, and Costa Maya that are proud of their Maya background, they will say a few words in Maya dialect, but Valladolid and the nearby pueblos truly embrace their heritage. It’s in everything that they do from the names of businesses, their traditional dress, and cuisine. Valladolidians are easily approachable. They will not go out of their way to engage you in a conversation, but once you initiate an exchange, they will happily talk with you for as long as you want to keep the conversation going. One of my favorite things about Valladolid is nobody solicits anything. The vendors in the markets don’t look at you like you’re a tourist as they do in Riviera Maya. No one is yelling “it only costs one dollar,” no ‘predatory vending’ or ‘come buys’ anywhere that we’ve been. The same can’t be said for the Mayan ruins around Valladolid, but even that is changing since the government banned stall vendors from the grounds of Chichen Itza. 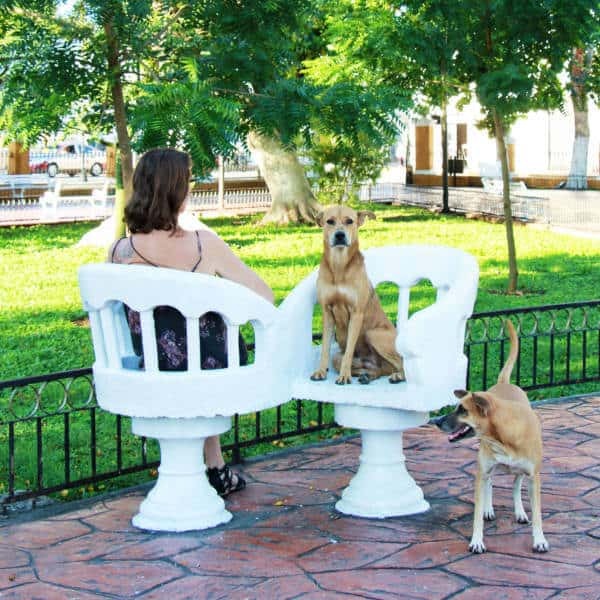 Centrally located in the Yucatan Peninsula, Valladolid is easy to get to by car or ADO bus. 90 miles west of the Riviera Maya, it takes less than two hours to drive to Valladolid from the closest airports of Merida and Cancun. And less than an hour from Tulum and Playa del Carmen. 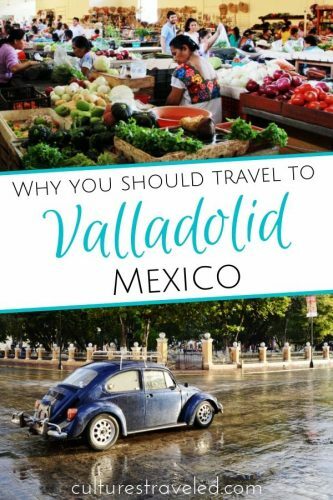 You can take a bus to Valladolid from Cancun, Playa del Carmen, Tulum, or Merida. While you can only buy tickets online with a Mexican credit card, you can check the ADO bus schedule and buy a ticket when you arrive. The ADO buses in Mexico are clean, comfortable, and have a bathroom. But wear warm clothes because the AC is ice cold. If you have headphones make sure they’re available. Most movies played on the bus broadcast over a speaker, but some only offer sound through a headphone jack. Mostly Spanish, but occasionally some movies are in English. Having not seen a lot of movies in the past 10 years, ADO has helped me catch up with some of the more recent blockbusters. Tip: If you’re already in Mexico and know the day you want to travel to Valladolid, buy a ticket a few days ahead of time to save money. Check if there is an ADO satellite office nearby to save time traveling to the station. Important Note: There is not a bus from the Cancun airport to Valladolid. Instead, you’ll have to take the bus from the airport to the city of Cancun and take another ADO bus to Valladolid. Have you traveled to Valladolid, Yucatan? Tell us what you think in the comments. Did you discover new things to do in Valladolid? Save it for Later! So exciting to see Ik Cat Ix mentioned here. We were there recently, and it was SUCH a wonderful experience. Dinner was brilliant, the setting was gorgeous, and I loved the tour – then to top it all off, we had trouble getting a taxi and the owner drove us home to our AirBnB. I’ve rarely experienced hospitality like it! Could not recommend this lovely restaurant more. Oh my gosh, that’s awesome that Jose, I believe his name is, went so far to help you. Don’t you just love the Yucatan hospitality! It definitely was a highlight of our meals while visiting Valladolid. We have since suggested a handful of our friends to dine there and I’m so glad to hear that the experiences are consistent.